Our Acharyas say that karma, jnAna and bhakti yOgAs need not be abandoned, but is done as kaimkaryam to bhagavAn. Is this then, the explanation for the "yOga rahasya" of nAthamunigal and the yOga anushtAnam of thirukkurugai kAvalappar? Both AcHAryAs were yOgIs, so this means they performed the yOgA sanctioned in sAstra and had a darshanam of perumAl, but that they did it as kaimkaryam and not as mOkshOpAyam. Am I correct in this understanding? very interesting observation swamy. nAthamunigaL was indeed a great yOgi - same probably goes for kurugaik kAvalappan who was in meditation/trance constantly. And in kurugai kAvalappan - ALavandhAr meeting, we can understand that kurugai kAvalappan was greatly enjoying bhagavath anubhavam through ashtAnga yOgam. The same is said to be the case in nAthamunigaL's life too - we can understand his greatness from the initial slOkams of ALavandhAr's sthOthra rathnam. Swamy, from Velukkudi Krishnan Swamy's upanyasam, adiyen understood (probably not fully understood due to adiyen's ignorance and sins) that for general upasana-marga-followers, they have to perform Karma or Gyana yoga to achieve atma-sakshadkaram and then move up the ladders to perform Bhakti yogam to get paramAtma sakshadkaram. Performing karma-yoga with trividha - tyagam etc sincerely and dedicatedly removes sins leading to realization of self and then the seed for Bhakti yoga is sown which is followed further. But for prapanaa, Bhagavan Himself stands as the Upayam for achieving parama-purushartham of nitya kainkaryam for His devotess at the end of this life itself. Sarangathi is not performed as an anga-prapatti, i.e an ancilliary for removing sins obstructing bhakti yogam but full prapathi for nitya kainkaryam as in Dwaya-mahamantram. 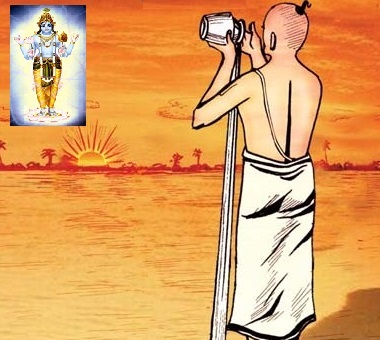 So, for prapannas, even for performing Bhakti with full preethi and love and devotion as an end by itself for Bhagavan's pleasure, how does the sins obstructing the realization of self and Bhagavan removed, as it is said para-bhakti and para-gyanam is achieved during archiradi marga only for prapannas. So, for prapaanas, during last stay in samsaraam, it is not possible for us to attain that love, kadhal and aavai for Bhagavan. For a samanya beginner person like adiyen trying to develop love for Bhagavan (as an end itself, not means), how does the anandhi-kala sins get destroyed leading to suddha-seshatva gyanam?? Sorry, if adiyen made some random queries out of ignorance. upEyam (goal) for prapanna is kainkaryam. That kainkaryam is a result of love and devotion towards emperumAn. That love and devotion is the result of bhagavath anubhavam (through sAdhu sangam, bhOdhayantha parasparam, etc). This is what is described as bhagavath anubhava janitha prIthi kAritha kainkaryam. So by emperumAn's grace we get sAdhu sangam (relationship with srIvaishNavas). Through that sAdhu sangam we learn more and more about emperumAn and become attached to him and develop the desire to serve him. this is the general process. the obstacles themselves are removed for a prapanna by the grace of emperumAn - pOya pizhaiyum pugutharuvAn ninRanavum thIyinil thUsAgum. Thank you very much Swamy for crisp reply. adiyen- its all what is heard from elders based on pUrvAchArya granthams - credit goes to them. thanks for the keen observation and question. every time i go thru our poorvacharya's explanations thru devarir's articles, adiyen is able find and understand something new which didnt occur before. Am sure its becos of adiyens acharyan's kripai. Emperuman is full of compassion and kripai but our acharyan's kripai is boundless and infinite to be mentioned. Adiyen would also like to gain knowledge from the commentaries from Acharya Hrydayam. If it has been already published please let me know the link. AchArya hrudhayam commentary by mAmunigaL can be purchased from srivasishnavasri and their contact details are available at http://srivaishnavagranthams.wordpress.com/purvacharya-literature/ . Not sure about any english commentary though - will inform if adiyen finds out about that. thank you so much. Adiyen not all that wellversed with Manipravalagranthms ..cds /explanation/commentary/lectures in tamil or english would be fantastic. adiyen remembers seeing a simple thamizh translation by Sri purushOthama naidu (very good scholar in our sampradhayam) - you may be able to purchase them from srivaishnavasri. Thanks a lot. Adiyen could contact them on landline and was informed to my surprise that they have Swamy Manavalamamuni's simple Tamil commentary of Acharya Hrudayam.